Vacuuming is the most important part of maintaining your carpets. The average family needs their carpets vacuumed at least twice a week to prevent soil build up. Make sure your vacuum is in good working order. Changing the bags before they are totally full allows better air flow. Keep the beater bar clear of long hair, string or anything that would impead smooth roller action in the beater bar and bearings. Carpet manufactures require regular cleanings in order to comply with the warranty provided. By following the protocol your carpets have the best chance of meeting the projected wear date. 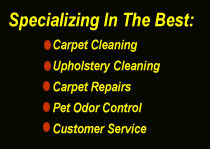 Keeping your carpets clean rather than having to clean them will insure your carpets will look better and last longer. After your carpets have been cleaned, avoid walking on them. Not only do you risk re-soiling, but wet carpet can be a fall hazard. Avoid turning on heaters. Open doors and windows allowing natural air flow help dry the carpets. To avoid costly repairs, do not allow beverages containing RED dyes in or around carpeted areas. Accidents Happen! When they accure it's nessesarry to spot clean. Always try using plain warm water first. With a non-color white cotton rag or towel, use a blotting action to progress the spot out. Using a hard brush can cause fiber damage and set a stain. If a stronger cleaning agent is needed, add a few drop of hand soap to the water and follow up with a clear water rinse. Improperly installed carpet will eventually result in wrinkles and waves. Power Stretching is the most effective way of repair. Tears, burns and indelible food stains can be repaired by using a "Cut and Plug" method. Done correctly, the repair will be unnoticeable. Always try to keep some carpet pieces from the original installation for possible future repairs. Pets are the number one cause of carpet damage. Pet urine, feces and vomit are a fact of life if you are a pet owner. There are numerious products on the market to home treat pet stains. Some work, most don't. Masking the ordor never works. Pet odor are bio-gasses emitted from bacteria feeding on the waste deposited by the pet. Killing the bacteria is the first step in killing the odor. Please feel free to call our help desk for directions on to deal with pet damage issues.